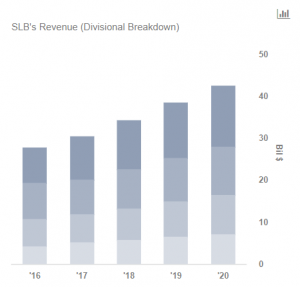 The downturn in the oil markets over the last three years caused Schlumberger (NYSE:SLB), the world’s largest oilfield services company, to post significant declines in its revenues and profitability. However, Schlumberger expects oil prices, and the demand for oil and gas drilling, to improve in 2018 driven by production cuts by OPEC and Non-OPEC members. Schlumberger should be a big beneficiary of the industry tailwinds, as it altered its businesses through acquisitions and investments to enhance its product offerings through the downturn while maintaining its leadership position in the market. In this note, we take a brief look at the company’s business segments and how we expect them to perform in the next few years. 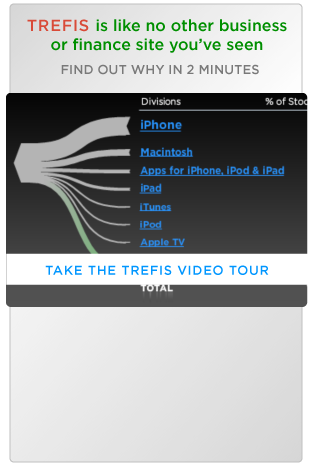 We have also created an interactive dashboard analysis outlining our expectations for the company. 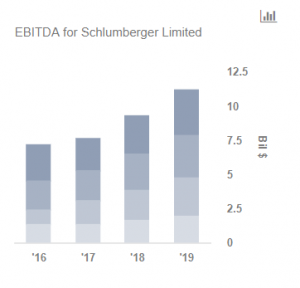 We expect Schlumberger’s revenues and EBITDA to see growth over the coming years, driven largely by an improving spending outlook for oil and gas companies. This growth in demand should provide a substantial boost to the company’s financials. Schlumberger’s Production business includes its OneStim as well as the Schlumberger Production Management (SPM) – which is Schlumberger’s way to develop and co-manage typical oil and gas projects. The company also acquired Weatherford’s U.S. hydraulic fracturing and pump-down perforating business for $430 million in 2017. This acquisition will augment SLB’s OneStim offering & compete with Halliburton. The company is also investing in various projects across the globe through SPM in 2017, which will drive its value in the coming years. 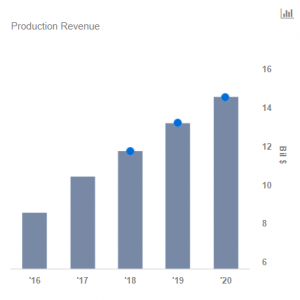 With the anticipated recovery in commodity prices, Schlumberger expects the demand for drilling services and other equipment to rise sharply. This should aid the company’s revenue growth in 2018 and beyond. As of last week, the U.S. rig count was up by 216 year-over-year, marking an increase of about 28%.